Need a reprieve from the CES 2017 madness? How 'bout an iPhone 8 rumor or two? A duo of juicy iPhone 8 bits comes courtesy of a Forbes chat with well-known leaker Sonny Dickson. Dickson dishes on details for the three iPhones due out this year, namely charging speeds and a "Tap to Wake" feature. And no, "three" isn't a typo as Dickson says there will indeed be a trio of new iPhones released in 2017. The more intriguing of the two murmurs is that one of the new iPhones - the redesigned iPhone 8 - has been singled out to feature Tap To Wake functionality. This would let users peek at notifications simply by tapping on the display, rather than having to press and swipe through. Android owners will note they've had this feature for a while now, so if tapping comes to pass on the iPhone 8, Apple will be playing catch up. It's also interesting that only the so-called iPhone 8 will apparently have Tap To Wake. The report refers to the other two iPhones as the iPhone 7S and iPhone 7S Plus, noting these won't deviate much from the look of the iPhones we've seen in the last few years. The other iPhone 8 rumor turns to the devices' charging ports. According to Dickson, a new "Tristar 3, Hydra" chip will oversee the portals, and this silicon will essentially allow for quicker charging. It's not exactly clear how the chip will do this, however. What's more, it's still muddy whether the next iPhone will have wireless charging, a rumored feature that's persisted in following the device around. 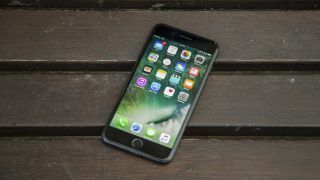 If anything, it seems a safe bet the next iPhone - or iPhones - will have faster charging ... somehow, as well as features we've never seen before in company's handset line. We'll know for sure in September, when Apple announces its all-new devices. Patience, dear reader. Patience.